Although programmed cell death (PD)-1 blockade induces immune-related adverse events (irAEs), little is known about the safety of PD-1 blockade after allogeneic hematopoietic stem cell transplantation (HSCT). Here, we describe immune system changes during nivolumab-related myositis in a patient with Hodgkin’s lymphoma after allogeneic HSCT; to our knowledge, this is the first such report in the literature. 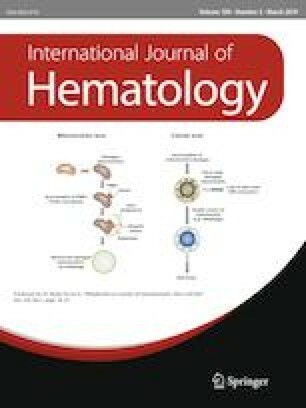 At the onset of myositis, the patient lost lower limb mobility against gravity, and had an activated immune profile with increased cytotoxic CD107a and granzyme B expression, as well as pro-inflammatory cytokines, interferon-γ, tumor necrosis factor-α, interleukin-2 in T and NK cells compared to healthy donor. Pulse steroid therapy decreased creatine kinase levels and induced PD-1 expression and regulatory T cells, but did not improve myositis; previously activated markers remained high. Four-week corticosteroid therapy decreased previously activated markers and the myositis improved. These findings provide new insights into nivolumab-induced irAE pathogenesis and suggest possible optimal treatments for irAEs. The online version of this article ( https://doi.org/10.1007/s12185-018-02584-9) contains supplementary material, which is available to authorized users. N.T. received grants from Ono Pharmaceutical. The other authors declare no conflict of interest.